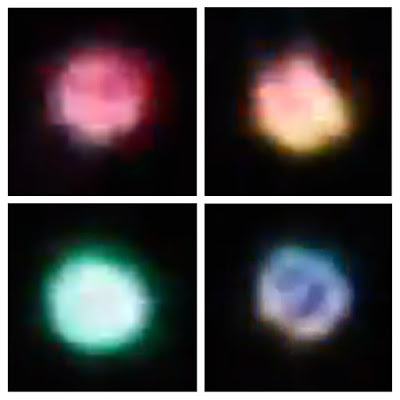 UFO SIGHTINGS DAILY: Colorful UFO in Surrey B.C. Canada November 2015, Video, UFO Sighting News. Colorful UFO in Surrey B.C. Canada November 2015, Video, UFO Sighting News. This colorful UFO is something to see, but don't let the lights fool you. Often people say that the colors mean its fake. Actually a police officer recorded such a colourful disk landing in front of his squad car on dash cam, so I would say it is possible. Spotted this from my bedroom window this evening - November 29, 2015. Approx time 11:30PM. At first I thought it was a helicopter, but it wasn't moving in any particular direction. With my camera in hand I went out back, and this is what I captured. The more I zoomed in, the harder it was to stay still and keep the "UFO" centered. It wasn't moving around - that's my lack of tri-pod :P LOL Though near the end I did notice that it started moving away from me. As I write this, it's no where in sight.